The House Ways and Means Committee will consider this week a permanent extension of 50 percent bonus expensing. Also known as bonus depreciation, bonus expensing allows all businesses to immediately deduct (expense) 50 percent of investment in equipment and software. Bonus expensing expired at the end of last year, along with a slew of other “tax extenders,” and since then businesses have been operating under the normal depreciation system, which requires business to delay investment deductions for years or decades without any compensation for inflation or the time value of money. Normal depreciation raises the cost of capital and hurts investment. Full expensing is ideal for investment and economic growth, and 50 percent bonus expensing for equipment and software takes a big step in that direction. Our simulation of a permanent extension of 50 percent bonus expensing indicates it would raise GDP over 1 percent, the capital stock over 3 percent, wages about 1 percent, and would create over 200,000 jobs. Such a sustained improvement in the economy would boost total federal tax revenue by about $23 billion, in our estimation, so this is one of the rare tax cuts that would pay for itself. In an earlier blog post I went over the short history of bonus expensing, which began in 2002 when it was passed on a temporary basis as part of the Bush tax cuts. Bonus expensing has only been passed on a temporary basis since, and fully expired from 2005 to 2007. The temporary nature, and the fact that it sometimes was passed retroactively, makes it difficult to see clearly the effect of bonus expensing on investment. As well, many other factors were in play, some of which, such as the Great Recession, completely overwhelm the effect of bonus expensing. Despite these issues, bonus expensing does appear to have boosted investment in equipment and software. 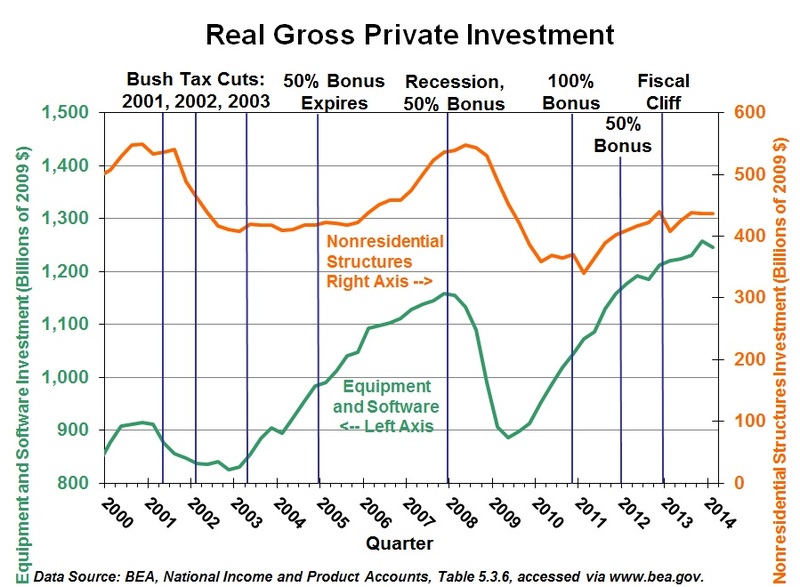 The chart below shows major tax changes since 2000, and real investment in equipment and software, to which bonus expensing applies, and real investment in nonresidential structures, to which bonus expensing does not apply (for the most part). The Bush tax cuts of 2003 were passed in the spring of that year, which among other things raised bonus expensing from 30 percent to 50 percent for all of 2003 and 2004, and also brought forward many other pro-growth measures. That quarter investment in equipment and software took off and continued to boom through 2004, while investment in structures was flat. Bonus expensing expired in 2005, after which growth in investment in equipment and software slowed and continued to slow through 2007. Meanwhile, investment in structures perked up in 2006 and 2007. The financial crisis that began in 2008 clearly hurt investment in both structures and equipment and software, despite 50 percent bonus expensing that year. However, bonus expensing apparently mitigated the drop in equipment and software. Structures fell further than equipment and software, dropping below the previous recession's lows. Bonus has been at 50 percent or more since 2008, during which time the recovery in equipment and software has been stronger than the recovery in structures. Investment in equipment and software grew at double digit rates in both 2010 and 2011, when bonus expensing was at 50 percent in 2010 and 100 percent in 2011. By the first quarter of 2012, investment in equipment and software exceeded in real terms the pre-crisis peaks. In contrast, investment in structures has yet to reach the pre-crises peaks and does not appear on track to do so anytime soon. Most recently, 50 percent bonus expensing expired at the end of 2013 and there was a noticeable jump in 4th quarter investment in equipment and software followed by a drop in the 1st quarter of 2014. No such pattern occurred with structures. In sum, bonus expensing, although enacted on a temporary basis, has likely boosted investment in equipment and software. If it were enacted permanently, the effects would be greater, as investors would have more certainty in the policy and would plan accordingly.